THE ACTUAL ADVENTURE TOOK PLACE IN APRIL 2009 BUT SINCE I ENDED UP WITH A "REAL JOB" I'M JUST GETTING AROUND TO ADDING THE STORY TO MY WEBSITE. 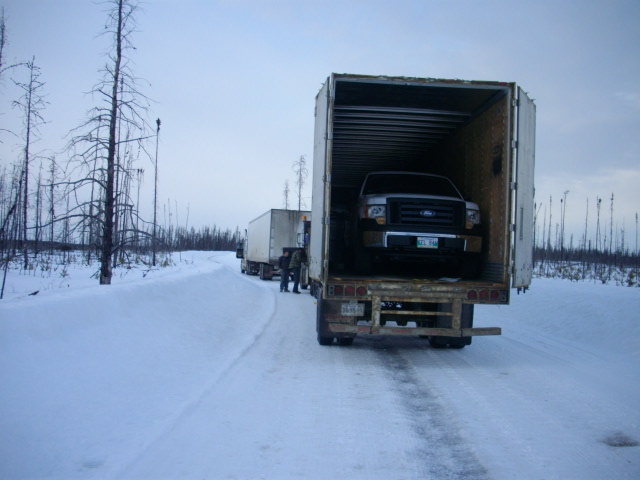 A FRIEND OF MINE WHO WILL NAME VINCENT AND I GOT ASKED TO HAUL 2 SEMI LOADS OF FREIGHT FROM LYNN LAKE TO LAC BROCHET. 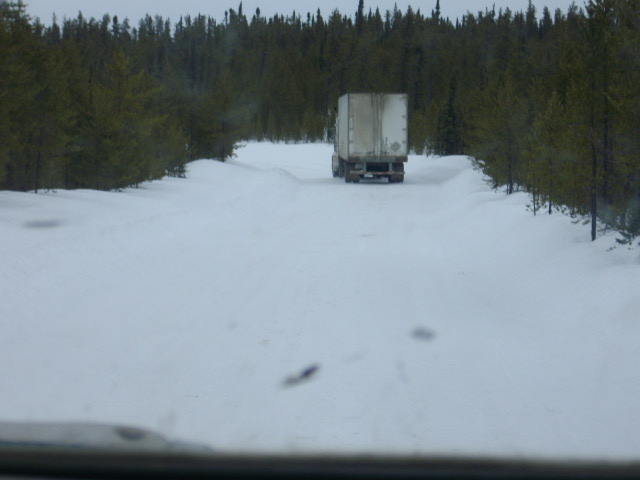 THIS IS NO BIG WOW BUT WE DID THE TRIP 2 WEEKS AFTER THE WINTER ROAD CLOSED FOR THE SEASON. 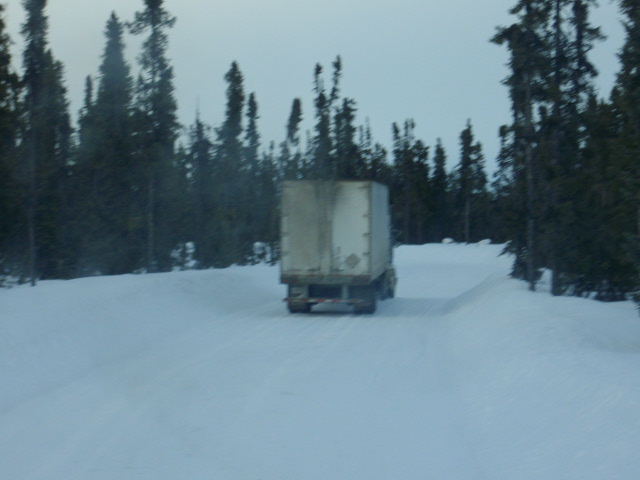 ONCE THE GOVERNMENT CLOSES THE ROAD YOU ARE ON YOUR OWN PLUS THERE S NO INSURANCE IF YOU HAVE AN ACCIDENT. HERE IS A QUICK MAP ON WHERE WE WENT AND OF COURSE MY COMPUTER IS ACTING UP SO I CAN'T MARK ON THE PICTURE. 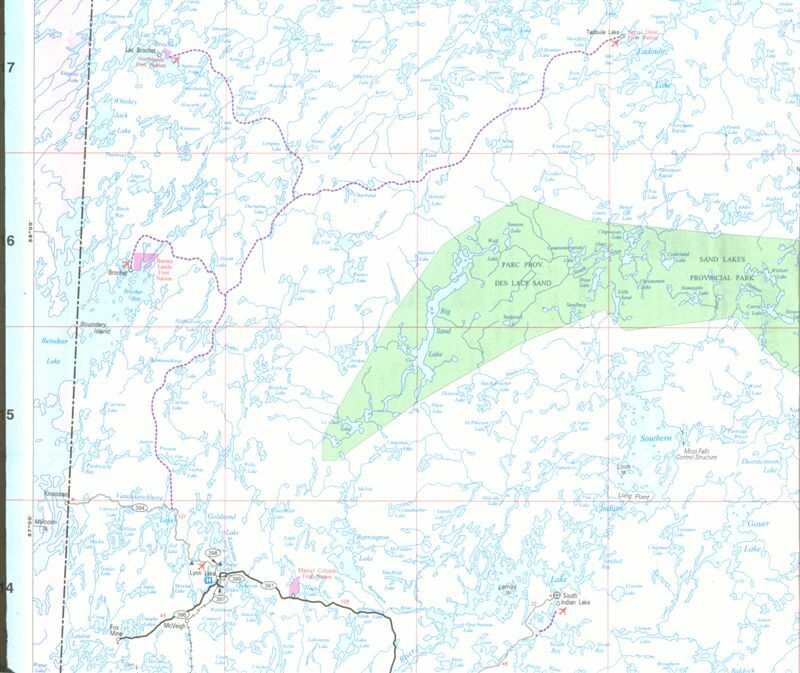 LYNN LAKE IS AT THE BOTTOM AND LAC BROCHET IS THE PLACE ON THE TOP LEFT SIDE. WILL TRY AND UPDATE THE MAP WHEN MY COMPUTER DECIDES TO LIKE ME, LOL. 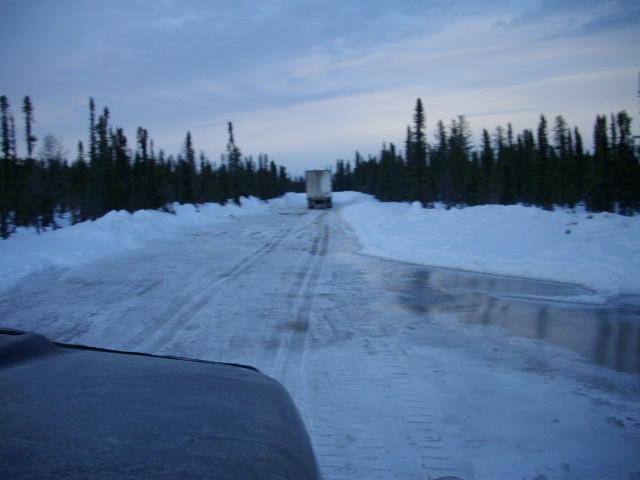 THE START OF THE WINTER ROAD IS 47kms FROM LYNN LAKE ON THE "KINOOSAO RALLY ROAD". 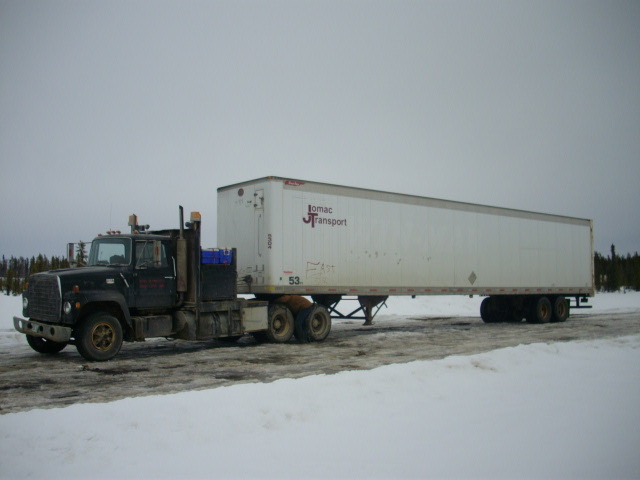 THIS IS WHERE WE INSTALL THE TIRE CHAINS ON THE SEMIS FOR TRACTION. 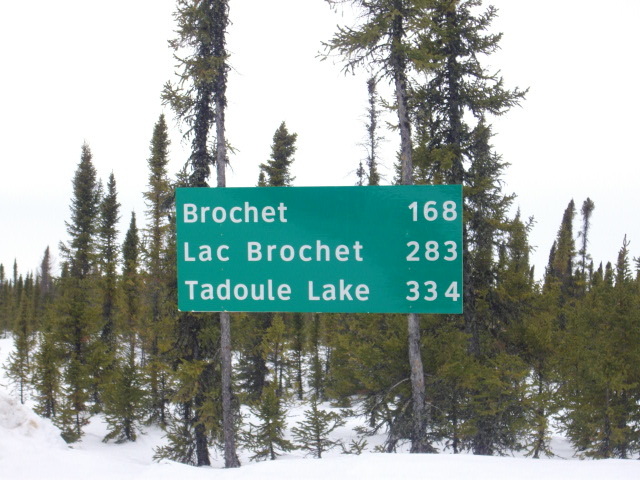 OF COURSE I HAVE TO GET A PICTURE OF THE MILEAGE SIGN TO SHOW THE DISTANCE TO LAC BROCHET WHICH WE WILL MEASURE IN DAYS NOT HOURS. 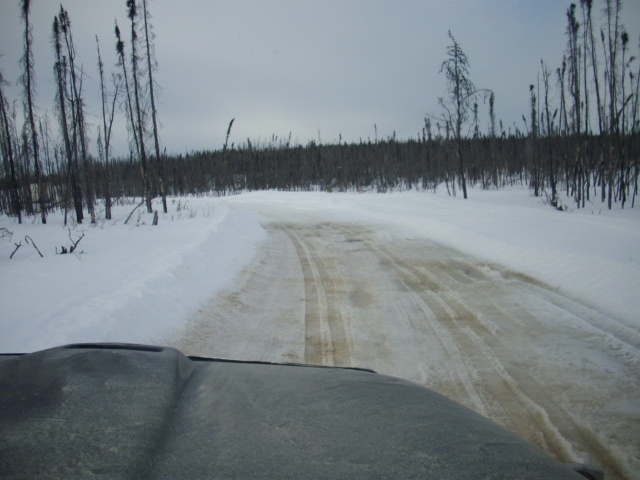 REMEMBER THIS IS A WINTER ROAD WHICH IS A SEASONAL ROAD PLOWED THROUGH THE BUSH IN THE GREAT WHITE NORTH. 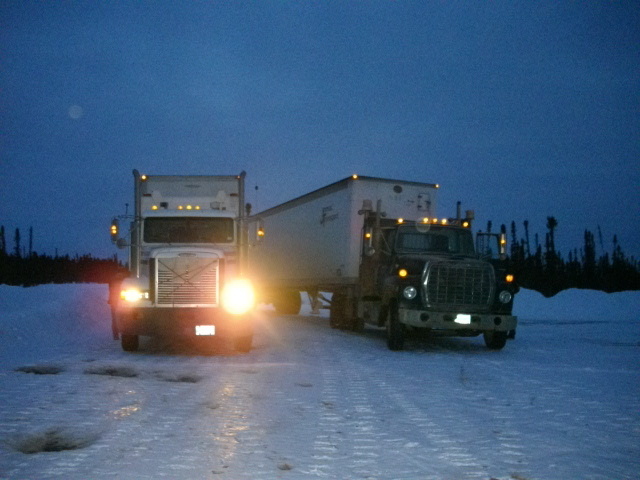 XENA AND I WILL BE FOLLOWING VINCENT IN HIS NEWER STYLE SEMI FOR THE NEXT 3 DAYS. THE VIEW FROM THE FRONT WINDSHIELD OF THE "SCREAMING FORD" DOES NOT CHANGE MUCH. 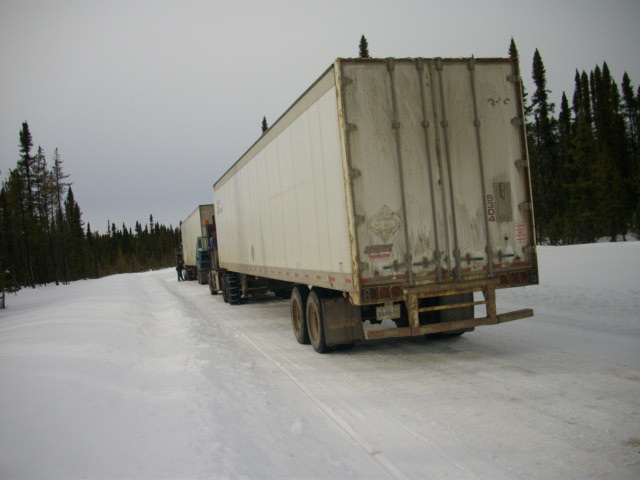 SINCE THE ROAD IS CLOSED, THERE IS NOT MUCH TRAFFIC SO WE CAN STOP IN THE MIDDLE OF THE ROAD AND CHECK THE SEMIS OVER. MORE BUSH AND WHITE SNOW PLUS HILLS AND CORNERS. 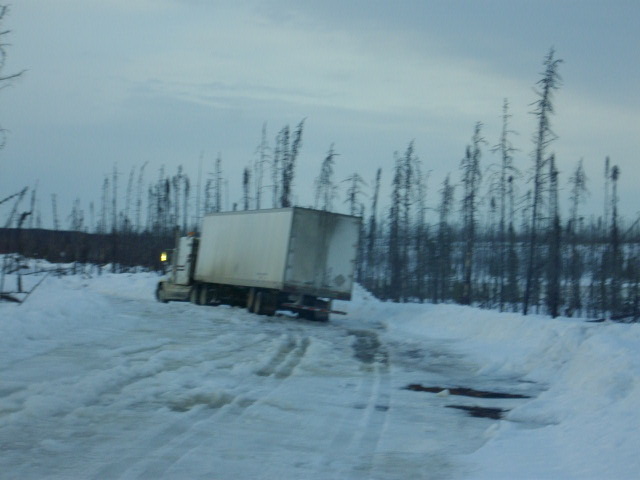 BUT YOU DO GET WATER FROM THE MELTING SNOW FLOWING ACROSS THE ROAD. THE FIRST OF MANY WATER HOLES ON THE TRIP. VINCENT GETS TO GO FIRST TO SEE HOW DEEP THE WATER IS. OF COURSE THE CAMERA DOES NOT SHOW HOW ROUGH IT REALLY IS THROUGH THE WATER HOLE. THE TRICK IS NOT TO BREAK ANYTHING. NOW THAT VINCENT HAS MADE IT THROUGH, IT IS MY TURN WITH THE "SCREAMING FORD". YOU LEAVE ONE WATER HOLE THEN IN TO ANOTHER ONE. 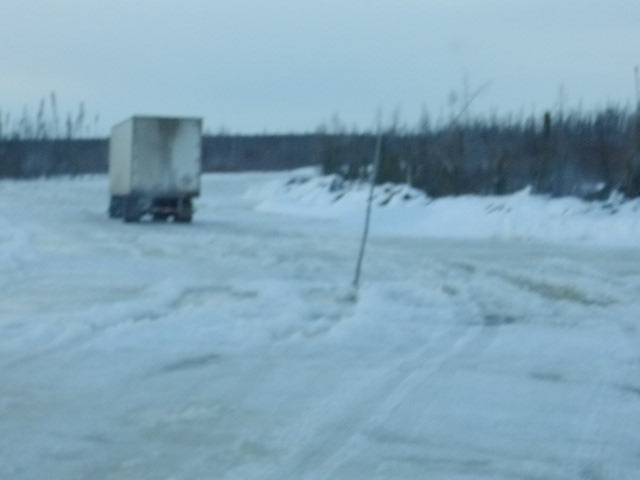 AFTER WE BOTH MADE IT THROUGH THE WATER HOLES, IT IS TIME TO CHECK THE SEMIS OVER FOR ANY DAMAGE. MY CAMERA MAN XENA IS GETTING BETTER AT TAKING THE PICTURES. 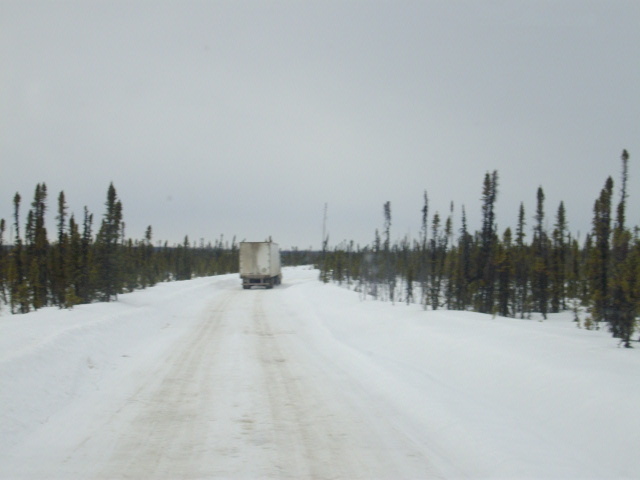 IT IS MORE BUSH AND WHITE SNOW AS WE TRAVEL TO THE NEXT WATER HOLE. 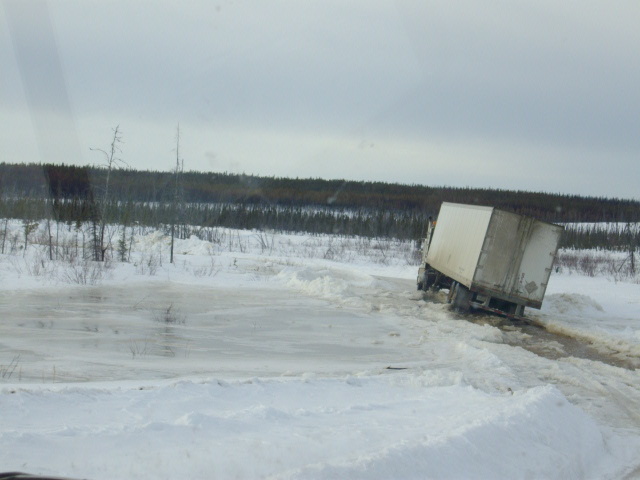 THE NEXT WATER HOLE IS FUN BECAUSE IT IS ON ANGLE SO YOU HAVE TO MISS THE BAD SPOTS BUT DON'T SLIDE OFF THE ROAD. THE STICKS IN THE ROAD MARK THE DEEP HOLES WHERE PEOPLE HAVE GOTTEN STUCK. 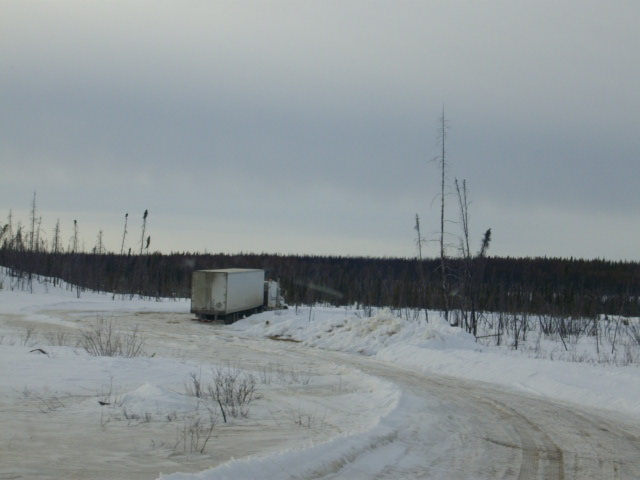 WE JUST DRIVE AROUND AND HOPE NOT TO GET STUCK. 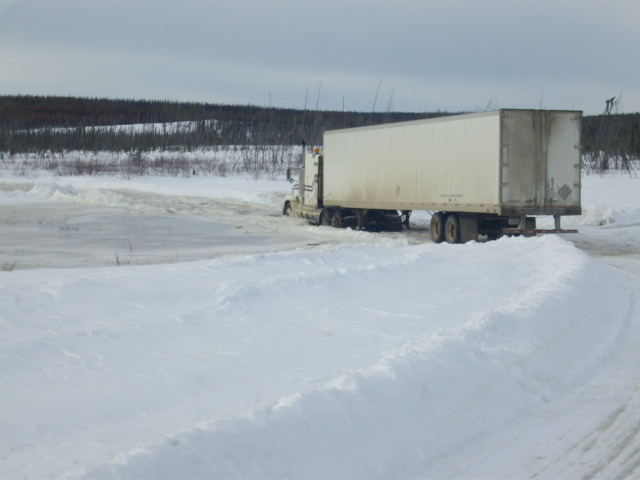 AFTER THIS LAST WATER HOLE, THE NEW TRUCK THAT IS IN THE TRAILER I'M HAUL HAS MOVED TO ONE SIDE. 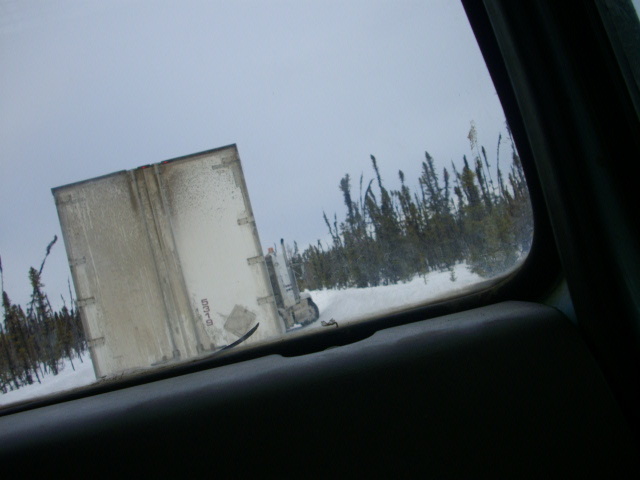 WE SPEND A LITTLE TIME AND CHAIN THE TRUCK SO IT DOESN'T MOVE. 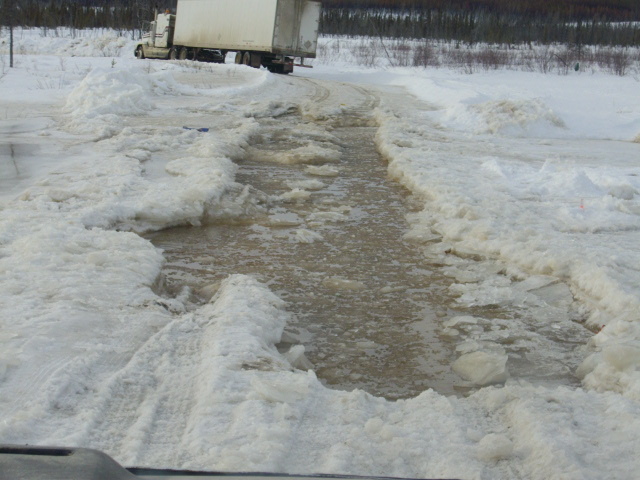 MORE WATER CROSSING THE ROAD WHICH IS NORMAL WHEN IT IS SPRING AND EVERYTHING IS MELTING. 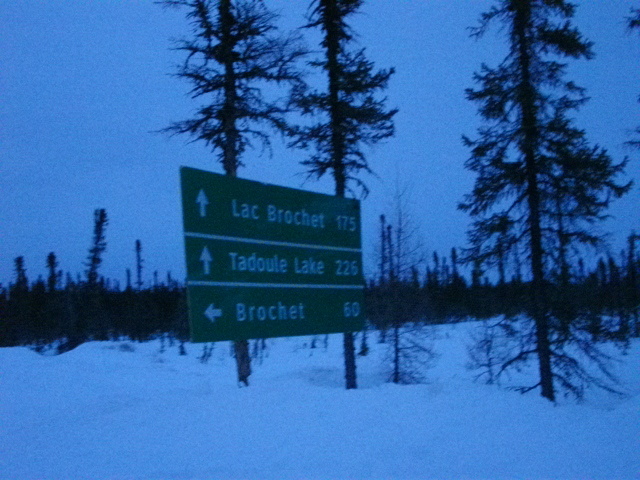 WE STOP AT THE BROCHET JUNCTION ON THE WINTER ROAD FOR SUPPER AND ADD CHAINS TO THE STEERING TIRES FOR MORE TRACTION. THE 108kms TOOK US 6 HOURS TO TRAVEL WHICH WE THINK IS GOOD. NOW THE FANCY CAMERA DOES NOT LIKE TAKING PICTURES IN THE DARK.